Craftin' Caro: Let's hear it for Lisa's lovelies! Let's hear it for Lisa's lovelies! Today's projects were shared with us courtesy of my lovely friend Lisa. I've known Lisa since 2003, when I was still a fairly new demonstrator, and her work continues to inspire me over the years -- I love it every time she emails me her latest projects (click on image to enlarge)! 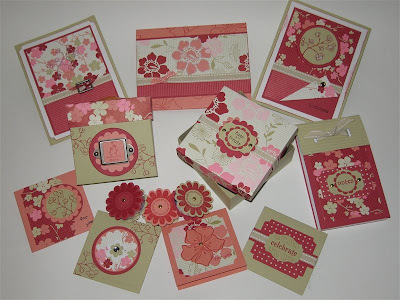 These cards and boxes feature the Ginger Blossoms Designer paper as well as Stampin' Up! 's Embrace Life set. I can also see her using lots of yummy Hodgepodge Hardware and various punches to give her cards that extra "je-ne-sais-quoi"; isn't she fab?? p.s. Keep watching the blog later on today for same samples of Wednesday's upcoming Masculine Card Camp. Hey Lisa! It all looks beautiful! These cards are wonderful! I love to use the same papers and stamps to create a variety of different cards, and it's so quick too!